I’ve done previous posts on using sensory bins with dried beans and fake snow and think that a perfect summer sensory bin is a sand bin. This is something that I would do in a low, wide plastic bin with a lid, so it can be stored away while not in use. I would also place it on a beach towel to contain the sand. 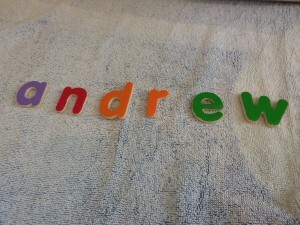 This may be something that your child already does all of the time but in the past it is not something that has been a preferred activity for Andrew. 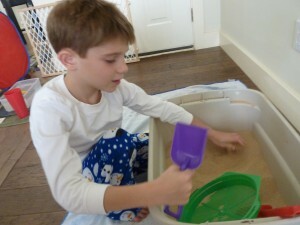 There are so many motor skills to work on, such as scooping, pouring, raking and sifting. 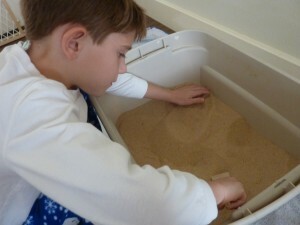 Hide some sand safe objects in the sand and the child uses their hands, fingers or tools to dig and find the objects. You can include a sheet of paper with a list of the hidden objects to help give purpose while also building literacy/vocabulary skills. Other objects that could be hidden are letters, numbers, blocks, cars, little toy animals or items that could be sorted by color or shape. Digging in the sand to find letters. 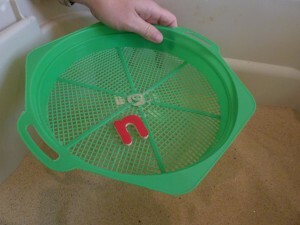 Using the sand sifter and finding the letter "n"! This type of activity is another example of the importance of reintroducing something that a child may not have been into before. 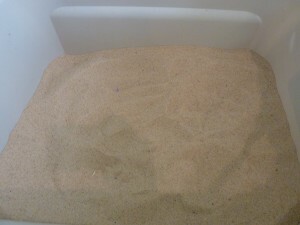 I have done sand bins with Andrew before and as I said above, he was not into it. Knowing how this goes but also wanting to give him another shot at experiencing this, I make sure that the station activities are easy to set up and keep my expectations in check, not planning on him spending hours playing in the sand as I did as a child. Fingers and hands in the sand! Look at that! One hand in the sand, the other one grasping the shovel. Hooray! An "M" was found!! I included the sand bin in our last My Obstacle Course and he was totally into it! I hid some letters that spelled out the word “summer” and he worked with his hands and with some tools that I provided to dig out the letters. He was so excited as he found each letter. 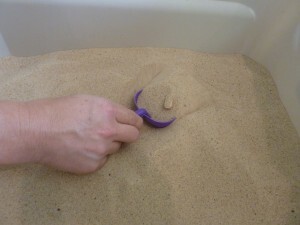 I even found him smoothing the sand with his hands and squeezing his sand filled hand, allowing the sand to sift through his fingers. 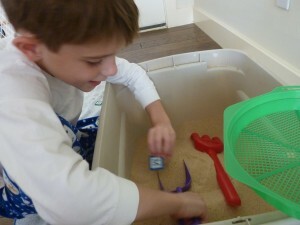 His hand muscles are clearly getting stronger, as I noticed him able to grasp and actually dig down into the sand. This is huge for us!! I look forward to providing more of these opportunities for him while also making sure to give it a purpose (spelling words, finding hidden objects, etc.) until he decides he is ready to just “play in the sand” (if and when this will happen).